I wrote a blog about hate this morning that I’m not going to post yet. Maybe it’ll become part of a series of blogs about emotions. We’ll see. I don’t believe in hate, in case you’re wondering. I also don’t believe in evil. I have a friend who says she doesn’t believe in sin. I don’t think 12 years of Catholic school will let me go that far, even though it might fit in with some of my philosophies. I can’t not sing along to “Breakfast at Tiffany’s”. It’s a little embarrassing at the office. The gates of hell. Link stolen from Neil Gaiman’s blog. 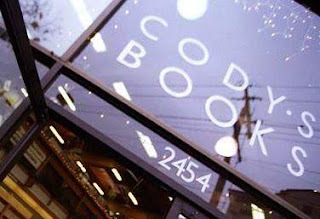 Cody’s closed in Berkeley. I tried to support their store in S.F. when it was there, but every time I went in there for a book, they didn’t have it. The nearby chain store always did. Still, it is sad. They at least tried to adapt.